Belly pork (or pork belly), shoulder and pork loin is often slow roasted to get even more flavour from the meat. Slow roasting is one of the easiest ways there is to cook a large cut of meat, whether it's pork, beef or lamb. Low-temperature roasting or slow roasting (below 250°F) is excellent for very large and/or tough cuts of meat. 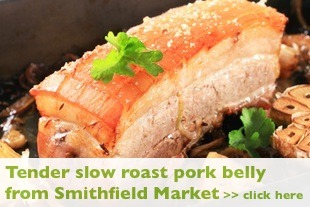 Slow roast pork belly, slow roast pork shoulder and other cuts of pork are wonderful if done correctly. Lowering the temperature reduces surface browning, but does allow the meat to cook more evenly both outside and in. Slow roasting also helps keep the entire roast moist, which reduces shrinkage and improves juiciness. Most importantly, slow-roasting allows time for the collagen to dissolve, and for enzymes in the meat to help break down and tenderize it, resulting in a more succulent texture. Generally, the larger the cut of meat, the lower the roasting temperature should be. Roasting at low temperatures provides the most flavoursome juicy and tender results. The steps below apply to any large cuts of meat that would typically be roasted, both boneless and bone-in. The timings are approximate for an 3.5kg (7lb 11oz) slow roast belly pork joint. But with slow cooking, it’s all about checking its progress, to ensure is does not dry out. Score the skin of the pork with a sharp knife and salt. Place the meat into a deep-sided roasting tray with 600ml/1pt water. Cover with foil and roast in the oven for three hours. Remove the foil, increase the oven temperature to 200C/400F/Gas 6 and cook for another 1½ hours, or until very tender and the skin is very crisp. Using a spoon and fork, tear the meat from the pork shoulder or belly and pile onto a plate. Finally add a few pieces of crackling. Now you have perfect slow roast pork belly. Enjoy.